we will be re-starting the poetry reading group. 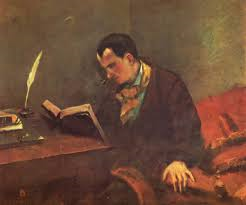 We will be looking at a selection of poems by Charles Baudelaire, with a heady mix of prostitutes, vampires, albatrosses and plenty of intoxication. Our own intoxicants (wine) and snacks will be provided. Handouts of the poems will be available in the trays opposite HumSS 110 and during the reading group. This entry was posted in Department of English Literature news and events and tagged Baudelaire, contemporary poetry dicsussion group, Department of English, Department of English Literature, English Department, English Literature, Reading, University of Reading. Bookmark the permalink.